After my failed attempt at reading to Arya in multiple languages with Language Nursery, I was hesitant to try another multi-language book. But My Numbers (Mis Numeros) by Rebecca Emberley was much easier to read. I also chose the book because the yellow front cover attracted by baby’s attention with seven colorful butterflies creating a bright contrast. My numbers is similar to the many counting books we have already read (Island Counting 1 2 3, Spot Counts From 1 to 10, 1 2 3 To The Zoo, and The Noisy Counting Book). Each pair of interior pages is dedicated to a single number between one and ten. The left side of every page has an illustration of the number and a text identification of the number in both English and Spanish. The right side has a drawing with a corresponding number of items and a text description of the items in English and Spanish. The colors of the numbers and the objects change from page to page while the background remains plain white throughout the book. Arya liked some of the pages with larger pictures, but she was bored by the pictures with muted color tones. The book would have been more interesting to her if the backgrounds were drawn in a different color to create more contrast within each image. 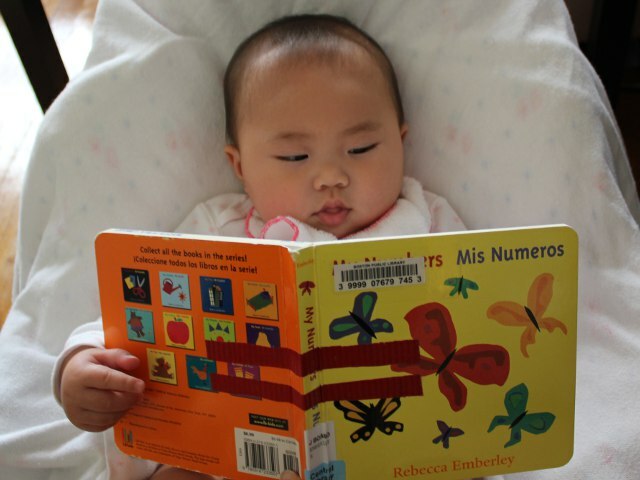 Although My Numbers is a bilingual book, it is much easier to read than other books in multiple languages. More than half of the words are just counting from uno to diez in Spanish. With only three words per pair of pages, few children would want to read the book by themselves. But for kids who are interesting in learning Spanish, My Numbers is an excellent way to introduce them to a foreign language. My Numbers costs (including shipping) under $7 new and under $4 used from Amazon.